Born in Kerala. Lives and works in Paris. 1961 Diploma in Painting, Govt. College of Arts and Crafts, Madras. 1967-70 Studied monumental art under Mr. Jean Bertholle and engraving under Mr. Lucien Chouteau. 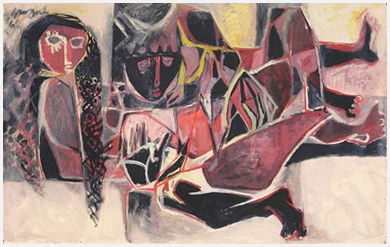 1961, 77 Group exhb., Lalit Kala Akademi, New Delhi. 1965 Solo exhb., Max Muller Bhavan, Goethe Institute, Madras. 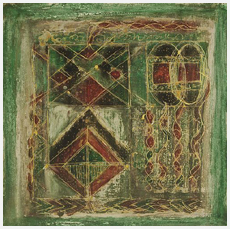 1966 Solo exhb., Triveni Gallery, New Delhi. 1970 Solo exhb., Transposition Gallery, Paris. 1970, 72 Group exhb., 2nd and 4th International Festival of Painting, Cagnes-sur-Mer, France. 1970 Group exhb., Le Prix Septentrion Exhb., Marcq-en-Baroeul. 1971 Solo exhb., Ostentor Gallery, Dortmund. 1971 Solo exhb., Falazik Gallery, Neuenkirchen. 1972 Solo exhb., The Gallery, Paris. 1972, 73, 74, 76 Group exhb., Salon Ralitis Nouvelles, Paris and Luxemburg. 1972, 84 All India Print Exhb., New Delhi. 1973 International Print Exhb., Manila. 1973 Novembre Vitry, Vitry-sur-Seine. 1973, 74, 76, 80, 83, 88 Solo exhb., Steintor Verlag Gallery, Germany. 1974 International Biennale, Menton. 1974 Solo exhb., Hennemann Gallery, Bonn. 1974, 86 Solo exhb., Mukai Gallery, Tokyo. 1975 International Triennale of Indian Art in India, New Delhi. 1976 Solo exhb. National Gallery of Modern Art, New Delhi. National Art Gallery, Chennai. Ahmedabad Museum, Ahmedabad. French Ministry of Culture, Paris. Kunsthalle, Wilhelmshaven. National Library, Paris. Govt. Museum, Bangalore. Glenbarra Art Museum, Himeji. Asia and Pacific Art Museum, Warsaw. Delhi Art Gallery, New Delhi. 1962-64 Received Indian Govt. Scholarship. 1963, 65, 66 Award, Lalit Kala Akademi, Madras. 1965 Award, Association of Young Painters and Sculptors, Madras. 1967-70 Received French Govt. Scholarship. 1972 Award, 4th International Festival of Painting, Cagnes-sur-Mer, France. 1972 Award, All India Print Exhb., New Delhi.